The most interesting and helpful item in the Moynihan Report is the graph that has come to be known as the “Moynihan Scissors.” Note how the two lines roughly parallel each other prior to 1962. 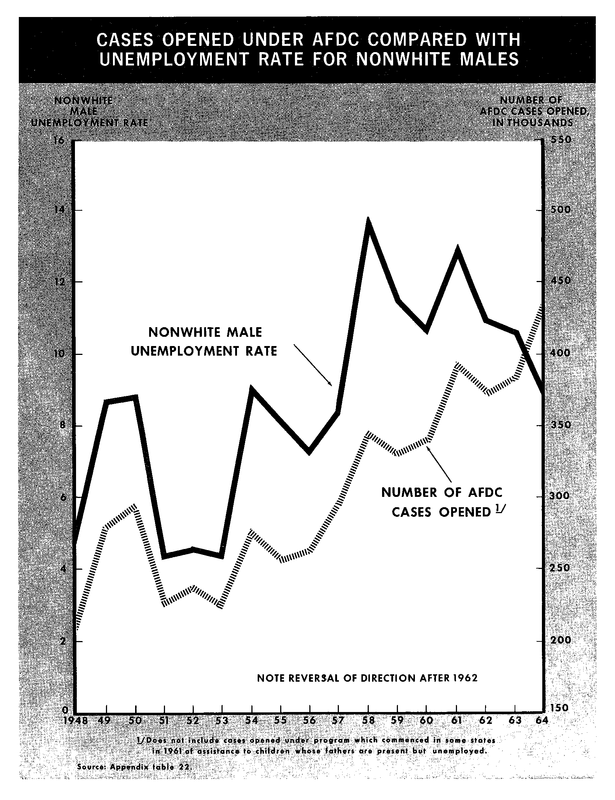 As male unemployment went up, AFDC cases went up. But around 1962 that relationship was broken. Male unemployment went down, but AFDC cases continued up. In 1963 the two lines crossed each other scissors-stye. This strongly suggests that it was not the loss of their jobs that caused Black men to lose their place in their families. What happened around 1962 was the ascendancy of the idea that women don’t need men, which may be true, but which was unjustifiably extended to the notion that children don’t need men and that women are all children need — an unfortunate example of the doctrine of Female Supremacy that has only gotten worse since the early 1960s and continues to wreak havoc on many children, families and communities today.